Happy Thursday! Today our spotlight weekly theme is Red, White, and Blue! With the holiday just one day away come share your red, white and blue looks you are wearing for the 4th! Elle and I would love to see your style! 1. 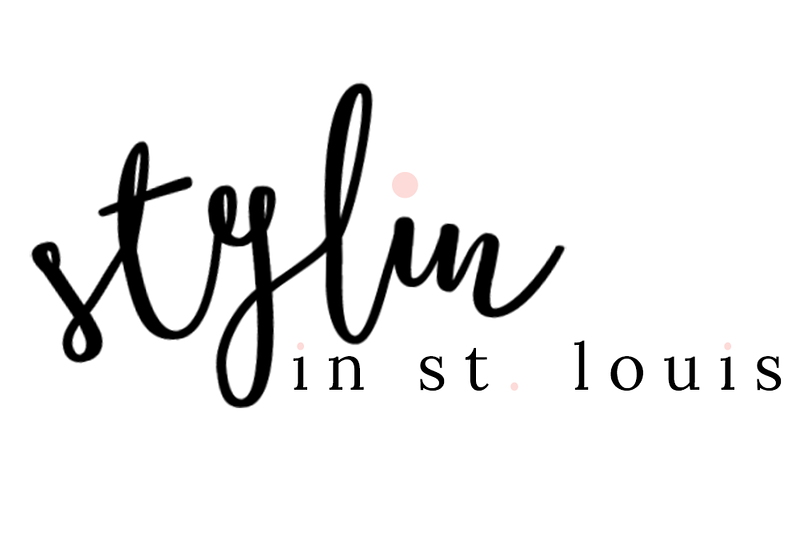 We kindly ask that you follow the two hosts: Elle from Living in Color Style and Jacqueline from Stylin' In St. Louis via Bloglovin or GFC and of course our co-host Claire of Little Miss Fashion Queen . Spotlight: Our spotlight of the week is Rebecca of Red Tag Chic blog! We just love Rebecca's summer wedges! This is such a fabulous summery look that looks so perfect with her adorable kimono! Be sure to check out her blog! 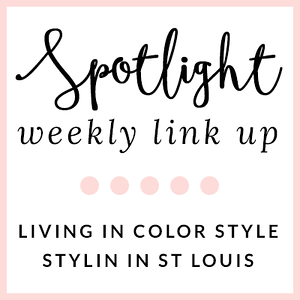 Nextweek: Next week our spotlight weekly theme is Summer Pastels! Thanks for linking up! See you next week! the blue and leopard is such a great combo, love that bag. Love the necklace, it's gorgeous! All 3 of you look gorgeous in your Red, White & Blue. I love your top, clutch and necklace very much. So chic and a little edgy, too with those bootie-sandal stilettos. 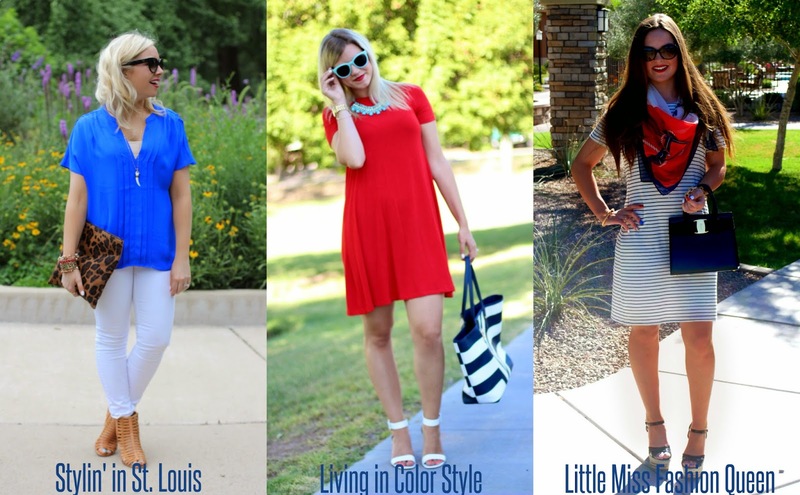 This is one of my favorite weeks to link up because I love Americana and Nautical Looks. Hope you like the Outfit I linked up. Have a Very Happy Holiday Weekend Gorgeous Jac!! Thank you Ada! You are so sweet! Have a great weekend! Love your bag! It adds a little more edginess to your outfit and goes great with your shoes! I love the cobalt blue with the bright white and animal print! It's a great look and perfect for the Forth of July! All of you ladies are looking so lovely in the RW&B!!! I love the shade of blue of your top Jacqueline....it's almost the same as the color of the tee I'm currently wearing! Hope you have a 4th as lovely as YOU!!! Thank you! Have a great 4th! That top is just the perfect shade of blue! Love it! You ladies killed it in the patriotic style game! Loving your cobalt blouse, babe. Happy 4th! Thanks Ashley! Have a great weekend! THIS IS SO CUTE! Love love love this blouse! That shade of blue is so pretty! I like how you styled it with the leopard clutch so it's not too holiday-ish. Great outfit, loving the blue with the leopard! GORGEOUS color on you-- so perfect with crisp white jeans! Love those pants!! Knowing me id drop ketchup or something right on them. But you look great! Love the blue paired with neutrals! Such a clean look! Enjoy your 4th! Adorable! Love that top! Have a wonderful 4th! This blue is amazing on you, and you always have the best lip color! And those shoes - drool worthy! Enjoy the 4th! I think we are going to brave the crowds and try and catch the fireworks at Busch after the game! love this! that blue is gorgeous with your white denim! happy fourth! Lovely outfit and I adore that leopard print clutch! Thanks so much for hosting the link up!